OM International Machine Tools is the Leading Manufacturers, Exporter & Suppliers of Oil Country Lathe machine manufacturing company, which exports high quality Oil Country Lathe Machine, Special Purpose Lathe Machine (SPM). It is Located at Batala, Punjab - India. 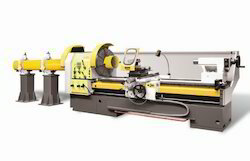 OM International Machine Tools is ruling the Oil Country Lathe Machine Manufacturing Empire with its working experience of almost about 3 decades. It keeps improving its infrastructure and manufacturing techniques whenever it is possible to provide best quality machines and tools. We are one of the leading manufacturers and suppliers of Heavy Duty Oil Country Lathe Machine. The offered planner lathe machine is made from high tensile steel, which is duly hardened for performing under high mechanical stress. Our supplied planner lathe machine is capable of producing plane surfaces, solids of revolution and helices. We are one of the leading manufacturers and suppliers of Oil Country Lathe Machine. The offered planner lathe machine is made from high tensile steel, which is duly hardened for performing under high mechanical stress. Our supplied planner lathe machine is capable of producing plane surfaces, solids of revolution and helices.